Thank you again for everyone who stopped by our booth this past week at the Western New England Fall Bridal Show. If you were unable to make it to the show, here’s what you missed! 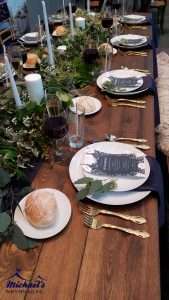 We created a beautiful woodsy tablescape in our booth. 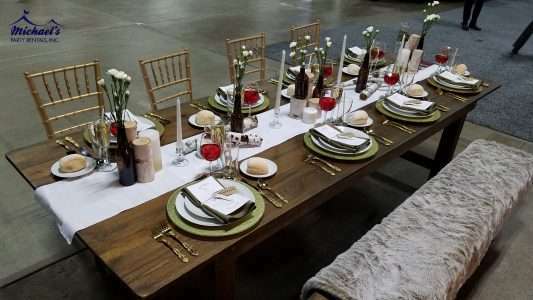 We started with our Tuscan table which is a foot wider than a typical 8′ banquet table. 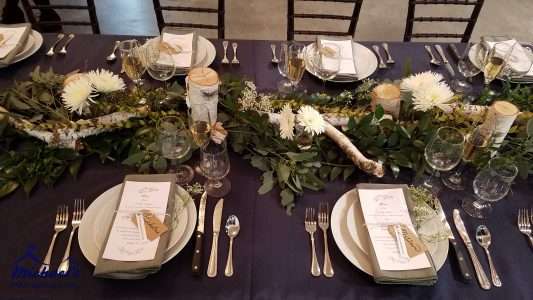 The extra foot allowed us to have space for birch branches, birch pillars, small vases with miscellaneous white flowers and heavy greenery. 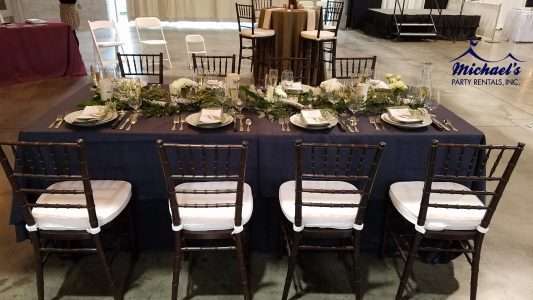 We paired this tables with our mahogany chiavari chairs and our nova solid navy tablecloth. We finished the look off with out white coupe china, army green napkins, menu cards and baby breath sprigs. 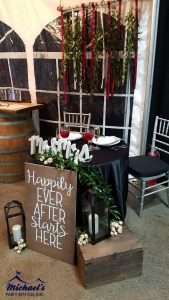 The next tablescape we created was a simple yet darling sweetheart table. 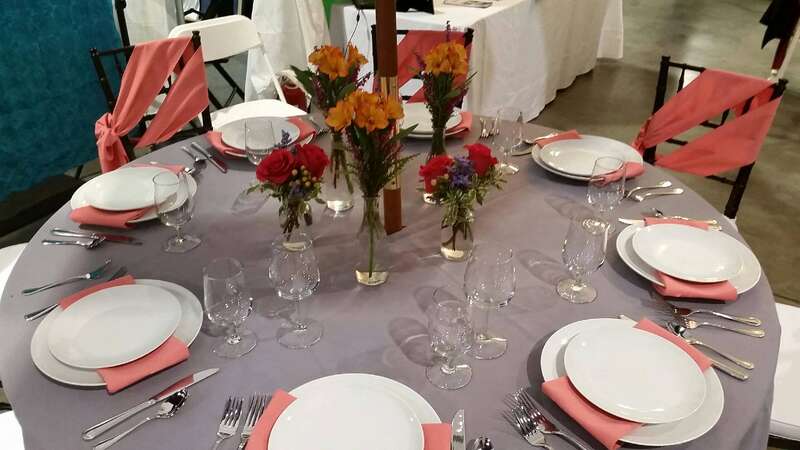 We started off with a 36″ round pedestal table and layered with with a white linen and a lace overlay. to keep with the simpleness, we add in white china and white chaiavri chairs. 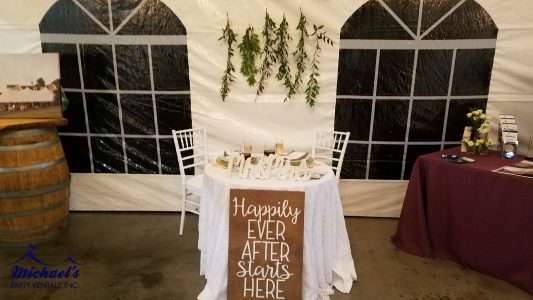 Behind the sweetheart table, we made a back drop using a birch branch and suspending greenery sprigs from it. 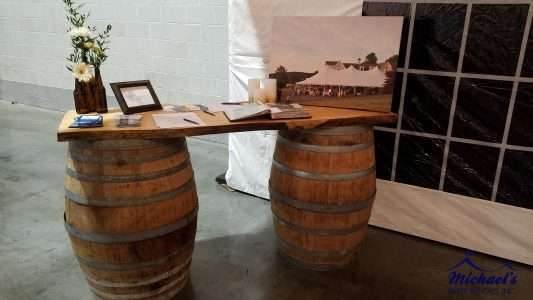 Our wine barrel plank bar made it’s day view at this show. We pressed it up with brown bottles with white flowers and more greenery. Are you as obsessed with our booth as we are? 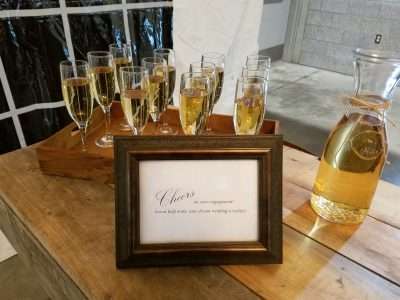 If so, give us a call today and we’ll help you recreate it for your next event! 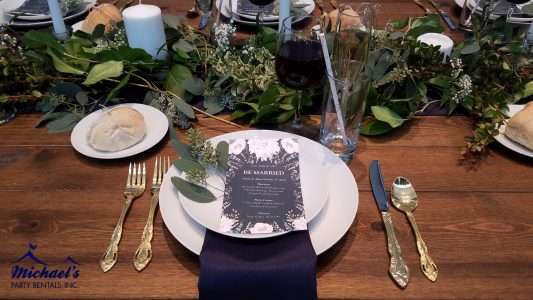 We’d like to extend a huge THANK YOU to all who came out to see us at the Western New England Fall Bridal Show and voted on our tabletop competition. Thanks to your votes, we won the Bride’s Choice Award! 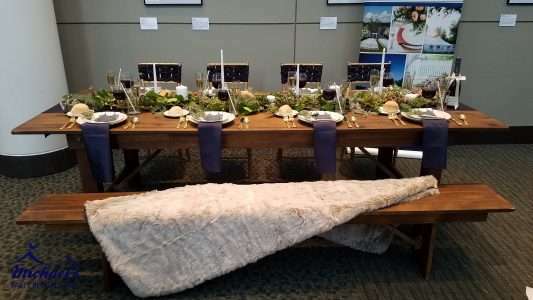 If you were unable to attend, here’s the tabletop we designed that took first place! 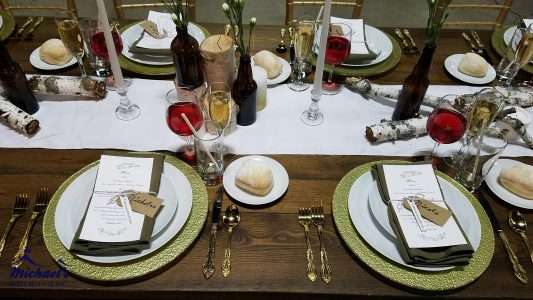 Our inspiration was a cozy woodsy dinner party and I think we nailed it! 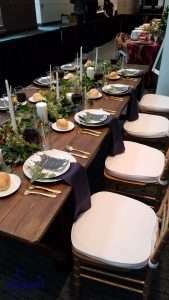 We started off with out 9′ wooden farm table, added a bench with a cozy fur blanket and some high back gold chiavari chairs. 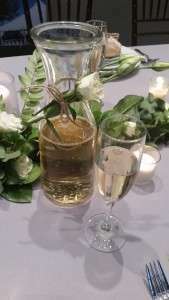 Next we layered a variety of miscellaneous greens with pops of baby’s breath. To add a little depth to the display, we added both pillared candles and candle sticks. 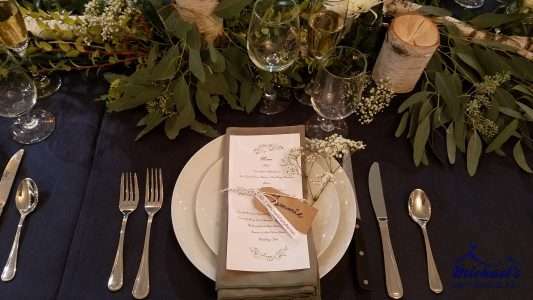 We added a few finishing touches such as navy floral menus, greenery sprigs and fresh rolls. 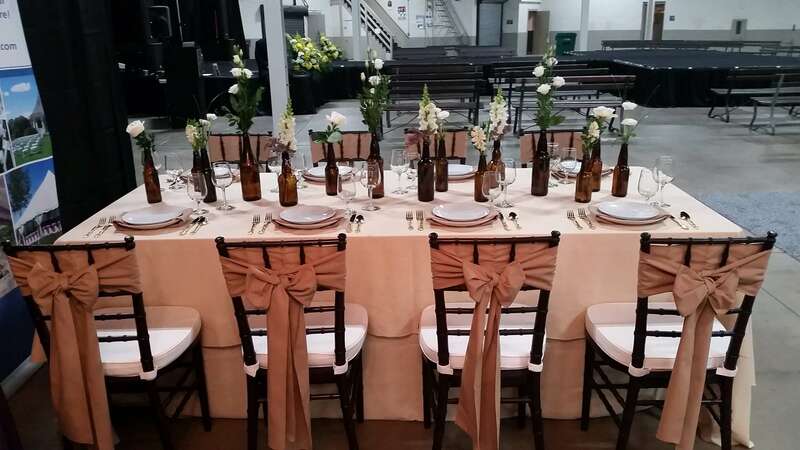 If you want to recreate this look at your next event, give us a call today! 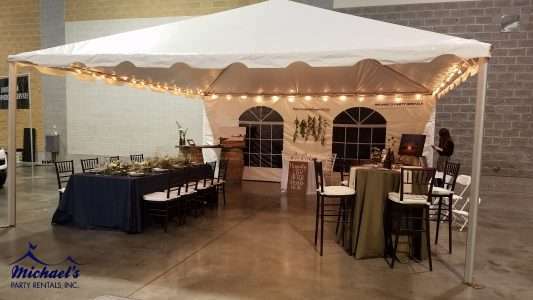 Did you attend the 2016 Western New England Fall Bridal Show? If not, don’t worry, we took plenty of photos to share! We are excited to announce that we have won the 2016 Bride’s Choice Award at the Western New England Fall Bridal Show! 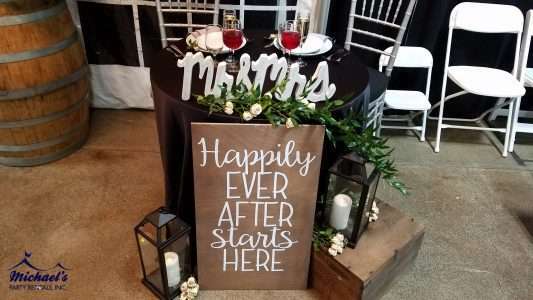 We would like to extend a HUGE thank you to all of the couples who voted for our table as well as Durocher Florist for supplying the flowers for our display. 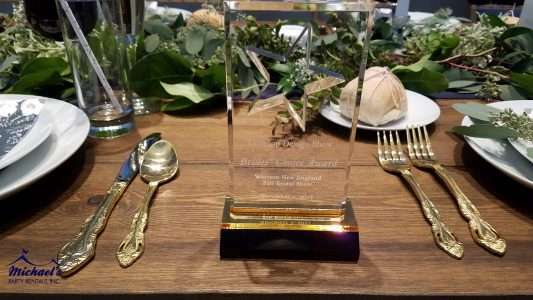 We are beyond honored to have been awarded the Bride’s Choice Award at the Western New England Fall Bridal Show! If you didn’t get a chance to check out our tabletop display at this year’s show, no worries! We took tons of photos to share with you and we’ll even let you know how to achieve this look on your own! 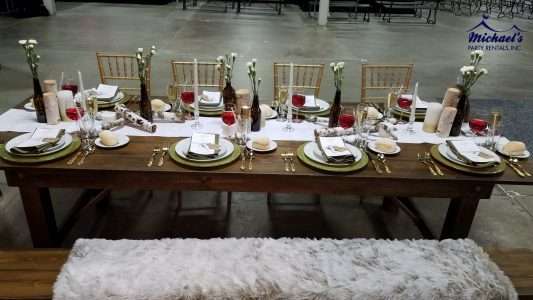 We started off with our Tuscan table which is 42″ wide and 8′ long. We paired this with out mahogany chiavari chairs and beautiful grey linens. Once the linens were on the table, we started setting the china, flatware and glassware. 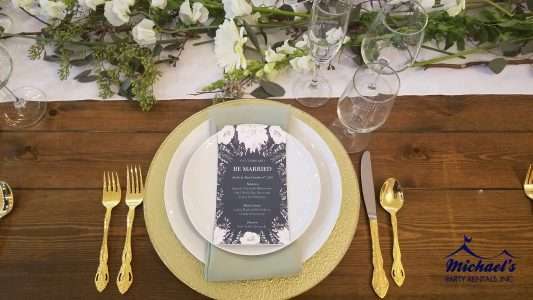 We used our white coupe china and regency flatware for a clean crisp look. 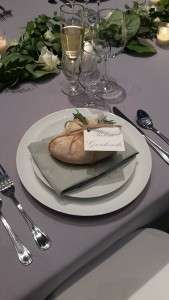 To add a pop of color to the table, each place setting was served champagne and a roll with rosemary. 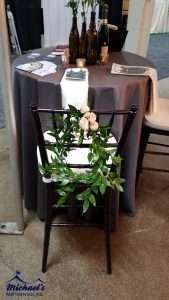 Our tabletop design was simple and elegant so we decided to heat things up in our booth!